Every year almost 13 lakh students write the engineering entrance exam JEE Mains and authorities are consistently making efforts to make the system smooth and transparent. The efforts made by the government and authorities are welcome and are appreciable but on the other hand my heart goes out to the parents and students who get impacted in process. Many of these changes have created a lot of pain for these lakhs of students and parents who are often caught off guard and have to struggle to adjust to the changes. Since the admissions are very competitive the students start their preparation atleast 2 years in advance and thus have to suffer whenever systemic changes are introduced and implemented within a short span of time. (9 months or so is a short duration for people who are preparing from last 1 and half year). 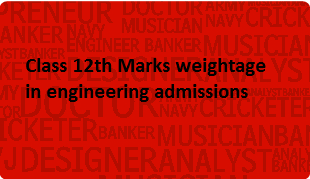 The engineering entrance system was changed a lot in 2012 when the two tier system of JEE Mains and JEE Advanced was introduced and class 12th marks were included in the admission system. A normalization formula was evolved. The students were required to score well in the entrance test and also were required to be in the top 20 percentile in their respective board exams. It was a sound decision as it encouraged the students to focus on their school studies along with preparations and discouraged the spread of prep schools that were following the rote method. When the changes were introduced the students who were preparing for engineering entrance with little focus on board marks were caught off guard and obviously it had an impact on admissions. In 2014 again the system was changed and a joint seat allocation board was made to allocate seats in IIT’s, NIT’s and CFTI’s for admissions in 2015. The class 12th marks weightage continued but now the students were required to score in entrance test and 40% weightage was given to class 12th marks for calculation of all India ranks. Two separate rank lists were made for admissions. One for IIT’s and another one for NIT’s and IIIT’s. The admissions season suffered some glitches, there was no option to cancel the seat and admissions were delayed as the boards did not send the data of the students in time to CBSE for seat allocation. The academic sessions in engineering colleges are delayed by atleast a week and it will impact the students.